WINDTECH Consultants has a particular interest in the study of wind effects on special structures. Wind-sensitive structures large and small that are unusual in form have a need for special modelling . This calls for knowledge of the limitations and an understanding of the principles behind wind tunnel testing. Often a special methodology and testing regime needs to be formulated to arrive at the most accurate results possible. using the rapid-prototyping technique. 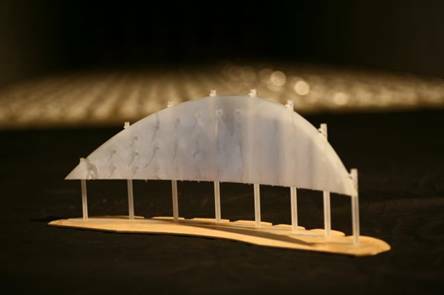 The model was configured with pressure taps within each ring and over the supporting shaft and was placed within a 1:50 scale model of the Khalifa Stadium. The model was designed such that the rings can be rotated to simulate the effect of different stages of the rings’ revolution relative to each other and for the erection mode configuration. Before commencement of testing, a study was carried out using a 1:300 scale model of the sports precinct to determine the effect of the surrounding structures on the upstream velocity and turbulence intensity profile for wind incident from different wind directions. These wind profiles were replicated at 1:50 scale to be used for this study. An extensive analysis was carried out of the wind climate for Doha. This included a seasonal extreme wind speed analysis to correspond with the time of year when this structure is to be in place. The high-frequency force balance technique was important as a check on the results of the Load Response Correlation technique. The need for the Load Response Correlation technique stems from the need to determine the relative displacements of the ring elements, as they need to operate within very strict limits to avoid the rings colliding with each other (there was an allowance for only a few centimeters gap between the concentric rings). The Load Response Correlation technique is also useful in providing a more accurate set of equivalent static loads for such an unusual structure. for the 2006 Asian Games, Doha. WINDTECH Consultants was also engaged to investigate the wind drag forces on a 150m long and 58m high video screen featured in the opening and closing ceremonies of the 2006 Asian Games in Doha. This screen consists of a matrix of LED screens connected via 25mm diameter vertical cables. The aim is to determine the wind drag for the design of the supporting structural frame, which consists of a series of 8 vertical space trusses. A special technique was used to simulate the flow around the cables in the scale model. This required a distortion of the scale of some of the elements as well as the porosity of the screen. Wind tunnel testing was carried out using both a force balance and a pressure tapped model to enable an accurate prediction of both the overall drag and the distribution of the wind forces on the large LED screen. WINDTECH Consultants was also responsible for the wind management plan for the opening and closing ceremony. An algorithm was developed based on wind tunnel testing to relate the wind speed at a number of wind speed monitoring stations to the wind effect on various mobiles used during those events. Windtech’s wind tunnel data for structural loads on tall buildings has been verified against results from several other laboratories from around the world.